About 25km southwest of Mostar is the small city of Medjugorje. Medjugorje is very popular among Catholic pilgrims who come here to pray, fast, confess and offer penance. The reason Međugorje became such a major pilgrimage site is because Mother Mary appeared here to six kids from the village, and gave them guidance and predictions for the future. It all happened in 1981, ten years before the Bosnian war started. 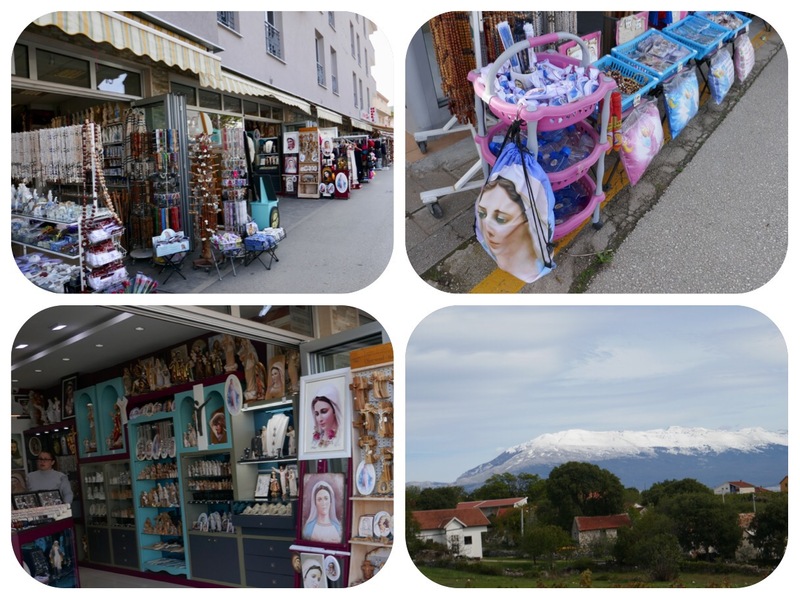 At that time, Međugorje was just a small village set among the hills, but after the appearance of Mary, it become a town full of shops selling religious icons, cafes, restaurants and hotels to accommodate the bus loads of pilgrims. Buses depart from the bus station in Mostar every few hours and the church in Međugorje runs an hourly service all day long. The church was erected on the same spot at which the kids saw Mother Mary. We saw thousands of people praying. Some were lined up in front of confessional booths, waiting to confess their “sins” to the attending priests. Many were gathered inside the church, filling it to capacity, but most sat outside and watched the service on a large TV screen. When the service was over, people lined up to receive communion, accepting the thin wafer from the priests. I was able to enter the church. It was unadorned, with cream colored walls, a cross and no paintings. I LOVE the Tibetan Buddhist Temples or the Serbian Orthodox churches with their stunning Fresco paintings all over the walls, and I envisioned that this church too, could greatly benefit and bring joy to the people by being cheery with some frescos. If they do not wish to paint the Catholic saints or scenes from the Bible, they could at least paint the six local kids and the apparition of Mother Mary that appeared before them. In my imagination, I painted the walls with vast flower fields, trees and a blue sky. I painted herds of sheep amidst lush valleys filled with wild herbs, and the six kids in their rough farm clothing. I painted Mother Mary in her white robes, holding her hands in the air in a gesture of blessing. And then I walked out to look at the pilgrims. A cross and a statue of Mary marked the exact spot where the kids saw Mary, and people were kneeling around it or crying in their prayers. A man was crying deeply, hugging the cross on his knees. When he was done, he climbed over the fence and placed fresh flowers in the hands of the statue of Mary. He was so shaken, people needed to give him a hand to rebalance him. Some families did not look like pilgrims, but simply as though they had come for a simple Sunday service. It was a Sunday, after all. The Catholic Church does not recognize Međugorje as a holy spot of a miraculous apparition. But this has not stop the pilgrims from coming. Sensitive people claim to still get messages from Mary today. Some of these messages are posted on the Medjugorje website. Many of these messages have a distinctly Catholic resonance, which does not ring to me as coming from Mother Mary. My understanding is that Mother Mary was Jewish and was fully raised in the Jewish faith and never renounced her Jewish religion to become a Zoroastrian or a Hindu or a Buddhist. This means that all the Christian terminology and mistranslation of the teachings of Jesus, were all added through the years into Christianity by a church that intended to control the people. “If God who is pure love and light is EVERYWHERE, and I assure you that He is, where can Hell be? The idea that we were born in original sin is erroneous. You were never really born into a body, it is an illusion you are dreaming into existence. But even if you imagine you were born into a human body, a baby is born of love, joy, ecstasy and passion. It is true that we all need spiritual guidance, but the idea that you are a sheep that needs a Shepherd is wrong. You are a free spirit and you learn from all of your experiences, not from the teachings of others. You can never be lost for long, for you are guided from within. Even if you’ll dream that you die, you will just be released from this illusion of the belief that you live inside your body. Then you will be free to dream attachment to another form, or stay in the invisible as long as you need rest and healing. The idea of Hell to the unbelievers is funny. The only Hell there is, is a sad life on earth for those who believe that they are separated from the Creator and from each others and who listen to their egos and live in poverty, pain and limitations. You need NOT believe in Christianity or in ANY religion. You simply need to seek the Truth inside, and discover who you REALLY are and experience your true Spiritual UNLIMITED Nature. When you discover who you are, you will know that you are ONE with GOD, that you are LOVE and you will not act against love by being or thinking unloving thoughts, for by doing so you will lose your peace of mind and your grace. Still, I was happy that I got to visit and see the place.